A recent report from the Centers for Disease Control and Prevention (CDC) concluded that food-borne illnesses strike millions of Americans each year, killing more than 3,000. Amidst all the clamor for “less government,” few of us want the federal government to slacken in its role of policing the food industry for our protection. Well, most of us at least. The CDC examined statistics from around the country and has found that each year one in six Americans (about 48 million people) get sick from food contamination, 128,000 are hospitalized, and 3,000 die from food-borne illnesses. Thirty-one pathogens are known to cause such illnesses, but many causes are still unidentified. The main killers are salmonella, toxoplasmosis, campylobacteriosis, norovirus, and listeria. Many such illnesses and deaths are caused by poor preparation of food by consumers, but more safety precautions by food producers and better inspections by the government can greatly reduce the risks of such food sicknesses. The FDA has been given more money to expand its inspection programs. Report – report suspected food illnesses to local health authorities. Madoff Secret Partner in Ponzi Scheme? One of Bernie Madoff’s supposed victims is suspected of being his secret partner in his multi-billion dollar Ponzi scheme. Multi-billionaire Jeffry Picower died suddenly in an accident last year, and now his widow has agreed to return a staggering $7.2 billion in profits from Madoff to help pay back the other victims. Picower actually made more on the Ponzi scheme than Madoff, with annual rates of return of more than 100% and some returns as high as 500% or even 950% per year. Some investigators believe Picower may even have been blackmailing Madoff, something his widow denies. Written by Angie Moreschi · Filed Under CWN, Featured | Comments Off on Madoff Secret Partner in Ponzi Scheme? The busy holiday shopping season has gift givers drawn to the time and money saving lure of online retailers. Free shipping, promo codes and heavy discounts may not spell a good deal when you have to return your purchase. Hidden restocking fees up to 25% may leave you “sticker shocked” when your holiday goodies turn sour. Your recent trip to the dentist may expose you to more radiation than the airport security x-ray machine. 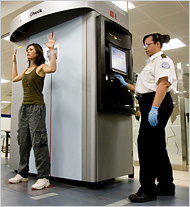 The controversy over “body scanners” at airports across the country has raised concerns over privacy as well as high levels of radiation exposure. One too many bad eggs for The Senate. Not the Senators themselves necessarily, but bad eggs getting through the US food-safety system. Oh, and unsafe poultry, bad peanut butter and spinach too. Recalls of tainted food that sickened thousands, finally led major food makers to join consumer advocates in demanding stronger governmental oversight. And that’s what led to Tuesday’s 73-25 passing of sweeping overhaul that strengthens the Food and Drug Administration in hopes of cracking down on unsafe foods before they harm people rather than after outbreaks occur. Read more in the The New York Times article. Written by editwizard · Filed Under CWN, Featured | Comments Off on Happy Thanksgiving! First it was the missing “note“, then blind “rubber stamping” of foreclosure documents and now Florida Judges are brought out of retirement to fast track foreclosures in the system. Is what they are doing fair? Before you take a bite of that Thanksgiving turkey (or leftovers), you may want to read on and make sure you’ve cooked that holiday bird well! Consumer Warning Network reported a few years ago that the 2008 Farm Bill loosened federal regulation of poultry inspections by allowing state inspection programs take the place of federal inspections. With Thanksgiving and Christmas dinners around the corner, how’s that little bit of federal deregulation working out? On November 14, the USDA announced the recall of 2600 pounds of cooked smoked turkey products that may be contaminated with Listeria monocytogenes, a deadly bacterial agent. The turkey products from New Braunfels Smokehouse in Texas had been inspected by the Food Safety and Inspection Service (FSIS). Consumers Union recently tested 382 whole chicken broilers bought at over 100 supermarkets nationwide, and tested them for salmonella and campylobacter, the two leading causes of food poisoning. Two-thirds of the raw chickens tested showed signs of one or both of these dangerous contaminants. A similar test back in 2003 had found such contaminants in half of the chickens examined. On the other hand, another test in 2007 had found a higher rate of contamination. The cleanest products came from Perdue chickens, but the worst came from Tyson and Foster Farms. Interestingly, all of the store brand “organic chickens” involved in the testing were free of salmonella. Of course, all chickens are presumably “organic,” but organic farmers usually follow more stringent standards in their smaller operations. So, are we better off with less federal regulation? The jury is still out. Now that your local state inspector doesn’t have as many pesky federal inspectors looking over his shoulder, it remains to be seen whether the level of safety will suffer. Is it acceptable that only one out of three poultry products can be considered safe? With every three poultry purchases at your supermarket, two of them will probably have bacterial contamination. This is why it is so important to follow safe cooking rules whenever you roast that turkey stuffed with dressing. Written by Terry Smiljanich · Filed Under Consumer Alerts! | Comments Off on Is Your Thanksgiving Turkey Safe? Does your monthly cell phone bill give you sticker shock? Many cell phone users may be underusing their pricey service plans by hundreds of dollars. Just by comparing your real time usage on your bill and your voice, data and text rates, you can lower your monthly bill. ABC News affiliate KHOU in Houston reports on what consumers have done to fight sticker shock. Click here to watch the story.